We've been traveling via train, bus and car thus far during our time in Italy. It's time for a little change. 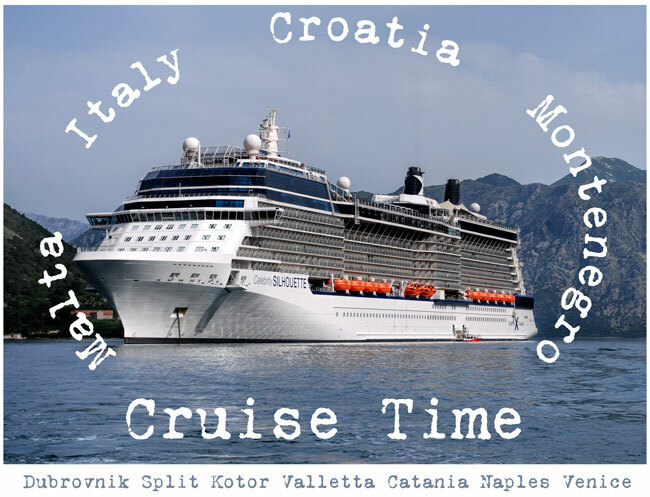 We're sailing round trip from Venice, the city of canals, gondolas and romance with stops in Dubrovnik and Split in Croatia, Naples, the islands of Sicily and Malta, and Koter in Montenegro. First port of call - Dubrovnik! 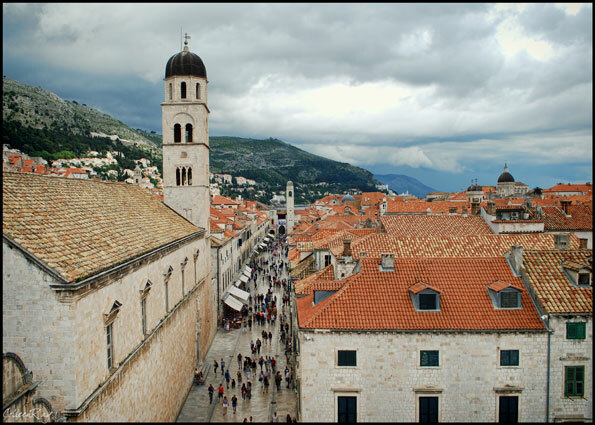 Known as the Pearl of the Adriatic, the centuries old walled city of Dubrovnik is back on the tourist route after years of devastation by bombs and artillery incurred during the war between Croatia and Serbia in the early 1990's. Walking the 15th century walls that encircle the city, it's hard to imagine bombs dropping from the sky. But here, and there, are reminders. 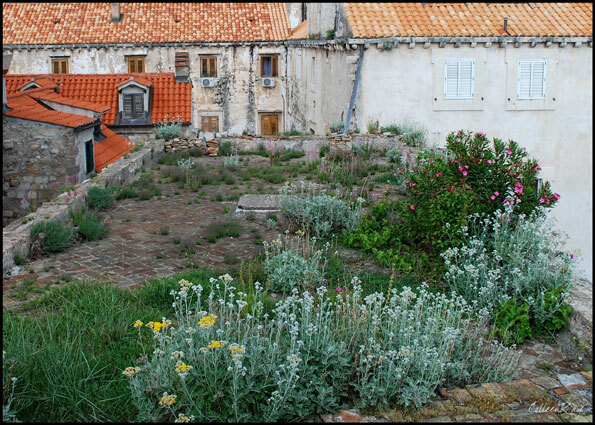 A foundation without a home, a crumbling wall, and most noticeably the bright new roof tiles sitting atop the weathered old stone buildings. Below the fortress walls, tourists fill up the main Stradun shopping for bargains, while the hardier visitors climb the steep cobblestone streets lined with cafes featuring fresh caught seafood. We managed to finish our walk along the ramparts just minutes before an hour long downpour turned the steep stairways into waterfalls. We didn't mind. We watched the deluge from the shelter of a little enoteca. The proprietor, happy for the sudden windfall of customers, hosted an impromptu seminar on local wine making and we all waited out the rain together sipping fine Croatian wine. The dramatic old city walls of Dubrovnik and the Adriatic Sea. A formidable fortress, wouldn't you say? Wall walking is the number one tourist activity in Dubrovnik. Pleasure boats dock in the old city. 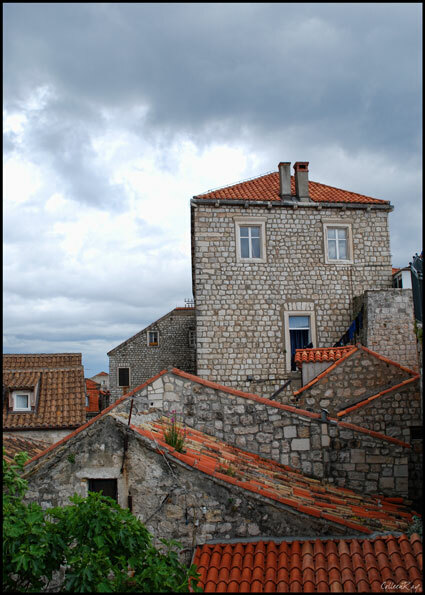 Dubrovnik's old city may be the tourism mecca of the moment, but for many, it's home. Remnants of walls damaged in the war contrast with the beauty of this rose garden. and seek the sun in narrow stairways. 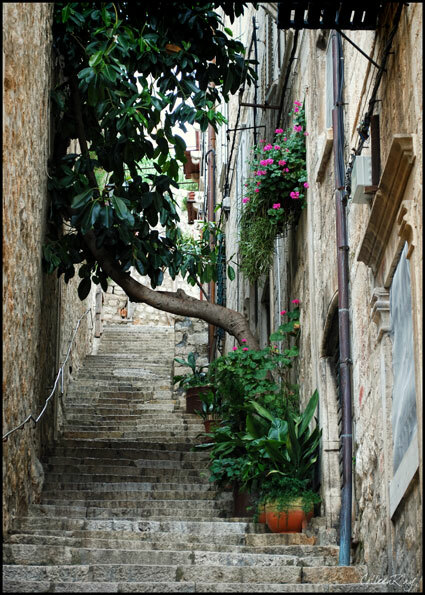 if you're willing to walk some stairs, there's much more to see in the old city. with the stairways turning to waterfalls description! Brand new roof tiles...old stone buildings. No wonder it's called the Pearl of the Adriatic.